*This is something to think about, today. We’ve hit a point when not only are candidates ridiculed and smeared, but their supporters are called names as well. We hear “I’m going to cancel your vote” and taunts like that. The cynicism has reached new heights. I’m hearing more and more voices in my lifetime that would limit who should be able to vote, and lamenting the many kinds of people who do. And they aren’t talking about race or gender, they’re talking about assumed intellectual and cognitive abilities. It is simply uncivil to begin to pick and choose who has worth in our system of deliberation and choice. Just yesterday I watched SNL’s “Undecided Voter” gag. And I’ll admit I chuckled a few times. It was a funny, satirical poke at how many of us look at the other voters around us, especially those who disagree with us. Still, civility demands of us a commitment to the value and worth of the other people participating in our discourse. I tweeted the last couple of days about the gift of allowing the other to speak and be heard. We won’t do that unless we understand our need for the other, their value and the importance of their participation. This entry was posted in October 2012 Civility and tagged Civility, Participation, Value, Voters, Worth. November 23, Civility is a reflection of humility. So the Proverb above warns us against a pride which isolates us from God’s favor. God prefers a person to live in humility instead of an inflated idea of self. God favors the oppressed. I think it reflects on God’s character that the joy of the Divine is found in favoring the least able and most needful. God doesn’t sit back and revel in one person’s great accumulation of wealth and pride in self, but in the opportunity to lift another from despair or to reveal that person’s hidden and less known value and worth. I get a strong sense that humility is actually the inner wealth we carry and live, while pride is an infection that can grow from the accumulation of material wealth. I said “can,” not must. God mocks the mockers. Among the lessons for civility we find in scripture, this one rings loud and clear. A prideful, disdainful attitude that mocks and decreases another’s value is not in line with the movement or favor of God. God isn’t laughing with you when you tear another person down. 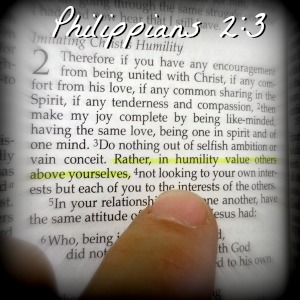 But a humility that reveals the worth of the other person is joining God in the Divine disposition. I think civility will be a natural outgrowth of choosing to reveal and support the other person’s value and dignity. It doesn’t mean I have to agree with everyone, but I sure better not value myself over them. I can disagree with someone while still protecting the inherent value of their life, opinions and aspirations. It’s not just that God loves an under dog, God loves to fill gaps of inequity and oppression. Civility, and the humility from which it grows, will create fewer of those gaps by affirming and revealing the value and dignity of others. This entry was posted in Civility, Devotional Thoughts and tagged Civility, dignity, Humility, Mocking, Value.